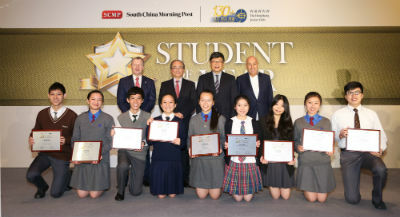 The Student of the Year Awards, an annual award jointly presented by the South China Morning Post and The Hong Kong Jockey Club, has recently named nine outstanding Hong Kong secondary students in recognition of their accomplishments in academics, linguistics, sports, the arts, science and mathematics, as well as community service. These commendable winners were shortlisted from over 400 nominated students, representing the best Form 4 to 6 / Grade 10 to 12 pupils of 133 secondary schools. These students underwent various rounds of interviews and performance auditions with panels of expert judges from fields corresponding to the nine award categories. The Awards, in its 34th year, were guided by the Advisory Board whose members included Mr. Winfried Engelbrecht-Bresges, CEO of The Hong Kong Jockey Club; Mr. Bernard Charnwut Chan, Hong Kong Deputy of National People’s Congress and Member of Hong Kong Government Executive Council; Mr. Douglas Woo, Chairman and Managing Director of Wheelock and Company; Mr. Allan Zeman, Chairman of Lan Kwai Fong Group & Honorary Advisor of Ocean Park and Mr. Robin Hu, CEO of the SCMP Group. At the Student of the Year awards presentation ceremony, the nine winners receive their accolades from (back row from left) Mr. Winfried Engelbrecht-Bresges, CEO of The Hong Kong Jockey Club; Mr. Eddie Ng, Secretary for Education, HKSAR Government; Mr. Robin Hu, CEO of the SCMP Group and Mr. Allan Zeman, Chairman of Lan Kwai Fong Group & Honorary Advisor of Ocean Park. Mr. Hu remarked: “Established more than 40 years ago, the Awards serve as a capstone for students to strive for, and act as a benchmark of excellence in the pursuit of academic, sports and arts brilliance. As the community paper of record in Hong Kong for the past 112 years, the SCMP is proud to have played a part in supporting these outstanding students’ pursuits”. Eunice Yiu of St. Paul’s Convent School (Secondary Section) was named Student of the Year – Grand Prize and received a HK$25,000 scholarship. Winners of the remaining eight categories were each awarded a HK$10,000 scholarship. First and second runners-up were presented scholarships of various value. At the award presentation ceremony held on 28 February, shortlisted students, finalists, student winners, principals, teachers, parents and judges enjoyed student performances including a harp recital, a violin recital and an a cappella serenade. Five tasteful student art pieces were also exhibited at the ceremony. For more information about the awards, please visit https://studentoftheyear.hk.